Jabiru is a town in the Northern Territory of Australia. Spend the 28th (Tue) exploring nature at Kakadu National park. And it doesn't end there: delve into the distant past at Ubirr, look for all kinds of wild species at Maguk Gorge, don't miss a visit to Bardedjilidji Walk, and contemplate the long history of Nourlangie Rock. 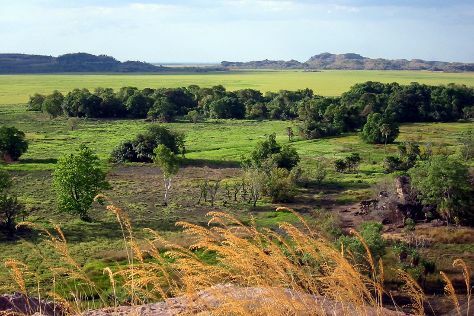 To see reviews, where to stay, and other tourist information, read Jabiru (Kakadu National Park) trip builder site . Singapore, Singapore to Jabiru (Kakadu National Park) is an approximately 13-hour flight. The time zone changes from Singapore Time to Australian Central Standard Time (Northern Territory), which is usually a 1 hour difference. Wrap up your sightseeing on the 28th (Tue) early enough to drive to Darwin. Go for a jaunt from Darwin to Batchelor to see Litchfield National Park about 1h 20 min away. Spend the 29th (Wed) wandering through the wild on a nature and wildlife tour. There's much more to do: see the interesting displays at Defence of Darwin Experience, take an unforgettable tour with a helicopter tour, take a leisurely stroll along Darwin Wharf Precinct, and make a splash at Wave Lagoon. To find where to stay, other places to visit, reviews, and other tourist information, you can read our Darwin driving holiday planner . Drive from Jabiru (Kakadu National Park) to Darwin in 2.5 hours. Alternatively, you can take a bus. May in Darwin sees daily highs of 38°C and lows of 26°C at night. Wrap up your sightseeing on the 1st (Sat) early enough to travel back home.